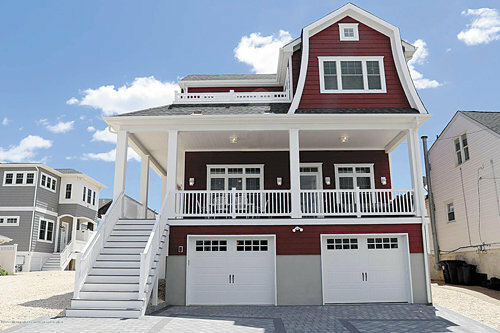 Lavallette, NJ 'High Point'' - This stunning home was just completed in the ideal location direct behind the oceanfront. Due to the naturally high elevation of this property, the structure offers breathtaking ocean views from the both the first and second level. Well thought out design offers ocean views from 4 bedrooms and the 5th looks west over all of Lavallette. Features include: 5 bedrooms, 3 1/2 bath, open floor plan, gourmet kitchen with 36'' Thermodor range & massive center island, 1st floor in-law suite, 3 guest bedrooms on the 2nd floor, large master suite with sitting room, master bath with 10' double shower and soaking tub, master bedroom deck overlooks the beach and the Virginia Ave jetty. Home is built on top of a 2 car garage with additional storage behind running the length of the house.